Dr Hastings then anticipates another likely objection – that the ‘medicine’ he recommends is difficult to get hold of. Fear not: he can recommend some suppliers. It may be useful to add that these new agents may chiefly be procured from the Zoological Gardens of London, Edinburgh, Leeds, Paris, and other large towns. 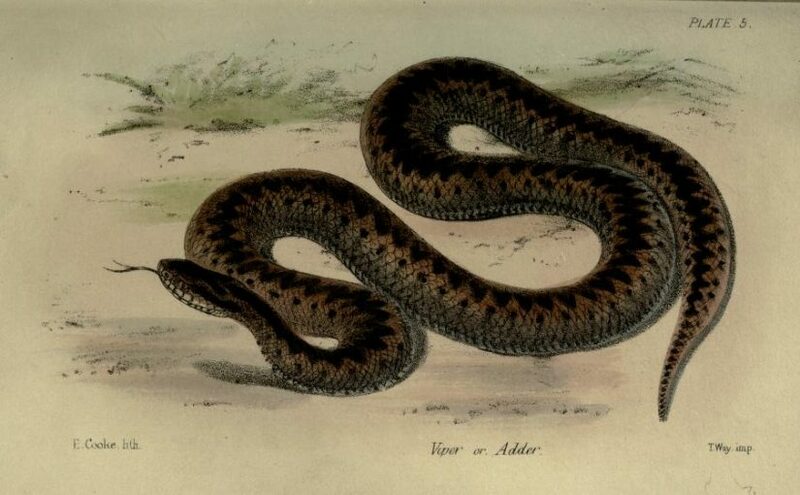 They may also be obtained from the dealers in reptiles, two of whom — Jamrach and Kice — reside in Ratcliffe-highway, whilst two or three others are to be found in Liverpool. One might reasonably ask what sort of medicine can only be purchased at a zoo or pet shop. Dr Hastings explains that he spent several years trying to find new medicinal substances in nature. Deciding that the pharmacy was already ‘crowded with medicines derived from the vegetable and mineral world’, he resolved to investigate possible miracle cures in the animal kingdom. 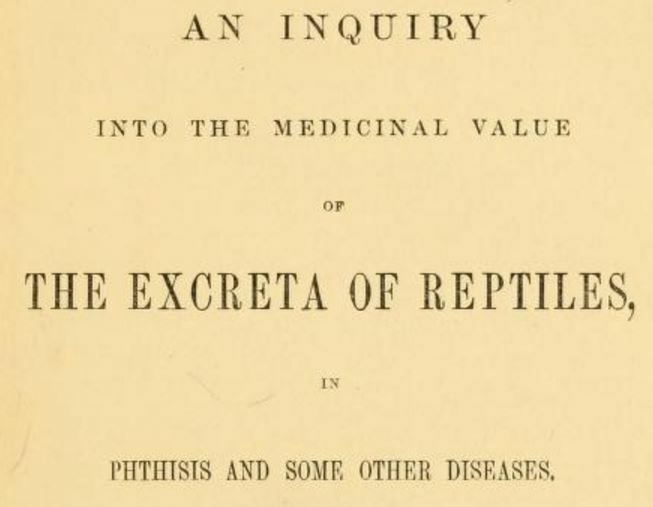 Yes, Dr Hastings’s miracle cure is reptile excrement. 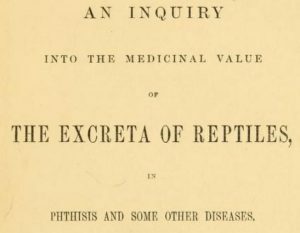 The book is entitled An Inquiry into the Medicinal Value of the Excreta of Reptiles. 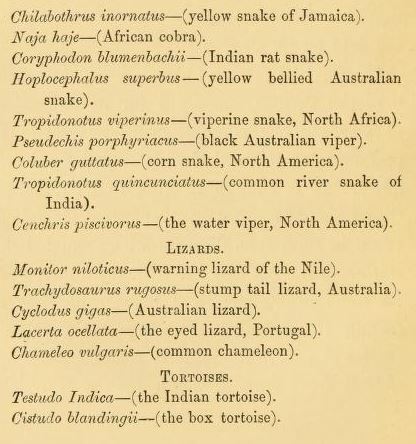 Which reptiles, you may be asking? I…applied to the walls of the left chest a lotion composed of the excreta of the boa constrictor of the strength of the ninety-sixth part of a grain to half an ounce of water. I commenced treating him with this in the early part of February, and finding that he manifestly improved I directed him to take a tea-spoonful of the same mixture internally three times a day, and subsequently increased the dose to a dessertspoonful. Under this treatment his amendment made rapid progress, until the month of May, when I prescribed for him a solution of the excreta of the monitor niloticus (warning lizard of the Nile) of the strength of the 200th part of a grain in two teaspoonfuls of water three times a day, and directed him to use the same mixture externally. This case is interesting, from the fact that I gave her the excreta of every serpent I have yet examined, and they all, without exception, after a few days’ use, occasioned headache or sickness, with diarrhoea to such an extent that I was obliged to relinquish their use. From the excreta of the lizards she experienced no inconvenience. She is now taking the excreta of the chameleo vulgaris (common chameleon) with great advantage, and is better than she has been at any one period during the last three years. This doctor, unfortunately, gives his cases—his exempla to prove his thesis; and we must, indeed, announce them as such to be lamentable failures as supporters of his proposition….We verily believe, and we say it most conscientiously, that if Dr. Hastings had rubbed in one-two-hundredth of a grain of cheese-parings, and had administered one-two-hundredth of a grain of chaff, and had treated his patients in other respects the same as he doubtless treated them, he would have obtained equally satisfactory results. As regards that—to ordinary men—unmanageable malady, consumption, all our difficulties are now at an end. The public may fly to Dr. Hastings this time with the fullest confidence that the great specific is in his grasp at last. 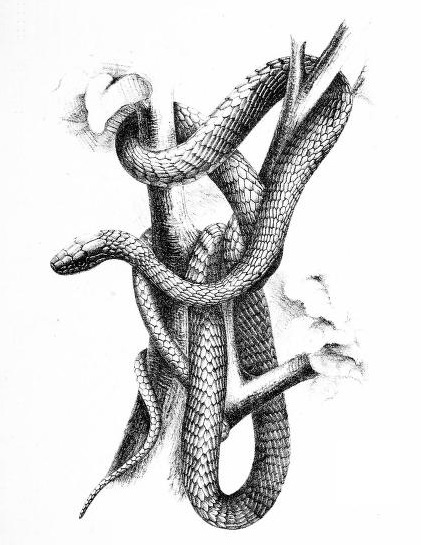 It might be that [Hastings] had discovered a remedy, and, if so, truth would prevail in the end; but it was not to be wondered at that the matter was treated rather sarcastically when the public were told that phthisis could be cured by the dung of snakes. At least he was open to new ideas and trying new things. Though, he obviously jumped the gun a bit when he declared them cures. I can’t help but wonder how they would have measured out 1/200th of a grain of anything. That’s 0.00032399455 grams. I suspect the BMJ had similar concerns.